Sandheep Nair from INTI International University joined more than 1,000 other students from across the world in Washington, DC with a plan and a commitment to turn people’s sympathy for disaster victims into action. The mass communication student who has personally helped in the cleanup of Pagoh, Johor after the floods; taught IT skills to children from rural areas; and helped abused orphans build their confidence was Malaysia’s only representative at the Clinton Global Initiative University (CGI U), an annual forum to educate and motivate young people to make a positive impact in the world. At George Washington University where the forum was held, Sandheep shared his idea – MY Media Assistance Programme – which aims to garner volunteers to rebuild natural disaster-stricken places by creating awareness. At the Clinton Global Initiative University (CGI U) meeting in Washington, DC, President Clinton met student attendees from Laureate International Universities and discussed how they would turn ideas into action through their CGI U commitments. Photo courtesy of Adam Schultz/Clinton Global Initiative. “We can use the power of media to spread the spirit of volunteerism and get as many people as possible to help. Volunteers will go in with cameras to interview those involved, including victims and authorities. The videos will be spread via social media to highlight volunteers’ efforts and bring to the fore the issues that people in disaster zones are facing. Getting more volunteers to step up and help as well as forcing the hand of the authorities to listen to the cries of their people are just a few of the key objectives,” he said. Built on the successful model of the Clinton Global Initiative which brings together world leaders to take action on global challenges, CGIU was launched by President William J. Clinton, 42nd President of the United States, in 2007 to engage the next generation of leaders on university campuses around the world. Sandheep was one of six students and the only one from Malaysia sponsored by Laureate International Universities to attend the fifth CGI U meeting from March 30 to April 1. The students, representing six institutions in the Laureate network, were selected based on their leadership skills, commitment to social change and academic track record. The event offered panel discussions and skill-building sessions on the meeting’s focus areas of education, the environment and climate change, peace and human rights, poverty alleviation, and public health. The attendees also took part in a community service project held in conjunction with the USO and Rebuilding Together to refurbish homes for low-income families. The Laureate students completed various home improvement projects needed by a female homeowner in Washington, DC. Students of INTI benefit not only from the institution’s over 25 years of experience and strong track-record, but also gain from the global synergy and resources that Laureate International Universities provides. INTI is a part of Laureate, the world’s largest private education network with a presence in 29 countries, with more than 60 accredited universities and 130 campuses, serving more than 675,000 students globally. 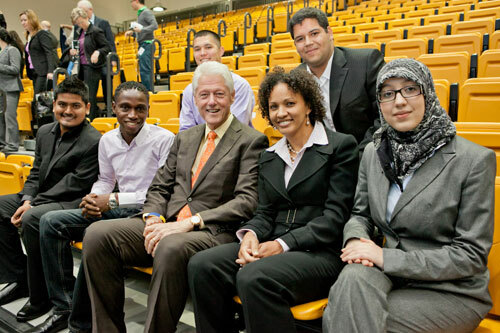 President William J. Clinton serves as The Honorary Chancellor of the Laureate International Universities network, a role in which he offers advice on social responsibility, youth leadership and increasing access to higher education.